The son of a Nepalese fruit seller has been declared the shortest man in the world, by Guinness World Records officials. 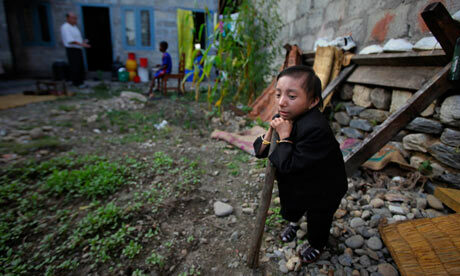 18 year old Kahagendra Thapa Magar is just 64cm (26.4in tall. Magar’s family has long campaigned for Guinness World Records officials to formalise his position but the organisation insisted on waiting until the teenager reached the age of 18. The new record holder greeted journalists at the family home in the town of Pokhara by jumping on a table, making tea for visitors and dancing to the sound of a toy drum. Magar, who weighs 6.5kg (12lb 5oz), was tiny even at birth, weighing just 600g (1.3lb). Local doctors believe he has a form of primordial dwarfism, an umbrella term for rare conditions affecting only hundreds of people globally. He has a big heart. He is contemplating deep thoughts resting upon his walking cane. The height has nothing to do with the stature of a man.